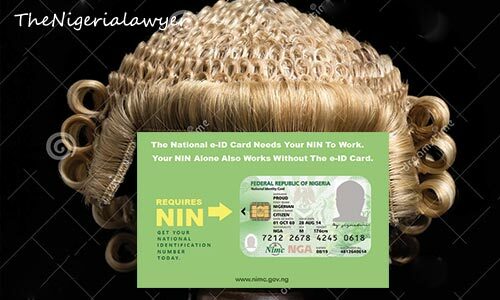 National Identification Number is Mandatory for all lawyers in Filing Court Processes. This is pursuant to the National Identity Management Commission Act, 2007 (Government Notice No. 123) which can be seen in page 5 and 6 of the gazette. This indicate that for a lawyer to carry out certain transactions he/she must provide his/her National Identification Number. (i) real time online verification from the NIMC Verification Service platform. (ii) Card Acceptance Device (CAD). (iv) a combination of the means stated in this paragraph. 4. (1)The Commission shall ensure *strict compliance* with the NIN requirements under the Act , the Mandatory Use of NIN Regulations , 2015 , these Regulations and the Nigeria Biometrics Standards Regulations ,2017. (a) ensure that every *agency* with statutory functions that requires identity management maintains a NIN and Biometrics Standards Compliance Register within its agency , which shall record the compliance with the Mandatory Use of the NIN Regulations 2015 , these Regulations and the Nigeria Biometrics Standards Regulations 2017. (e) obtain a Court warrant or order to seize and detain any book, record, document or other information storage system used for creation of identity or used as an identity database which does not conform with the Act, these Regulations and other relevant Regulations made pursuant to the Act, for such period and on such terms as the Court may consider expedient or necessary to carry out monitoring and enforcement procedure . The Commission May, in ensuring compliance with the provisions of these Regulations –(a) upon giving written notice of not less than 24 hours , have the right to conduct an audit on the *state of affairs and operations* of transactions or services carried out by applicable persons and entity . As time evolves, the applicability of these regulations would be put to operation and the enforcement mechanism to test. 8. In these Regulations, unless the context otherwise requires—Interpretations. “Person” means a natural individual and legal entity. Steps for enforcement. Noncompliance.